Campers at "English for Teens"
Quebec is unique compared to the rest of Canada. While the rest of Canada speaks English, Québécois speaks French. While the rest of Canada is influenced by Protestantism, Quebec has Catholic roots. It may seem that Quebec is exotic compared to the rest of the English speaking world, but it isn't. They suffer from materialism, hedonism, and post-Christianity just like the United States. They have the same social problems that we do: divorce, cohabitation, abortion, suicide, etc. They are lost in sin, just like their English speaking counterparts. So, what's the difference between Québécois and Anglophones? English! "English for Teens" is a program dedicated to teaching English and the Gospel. It is supported by our brethren at St. Marc's Reformed Church in Quebec City, Canada. 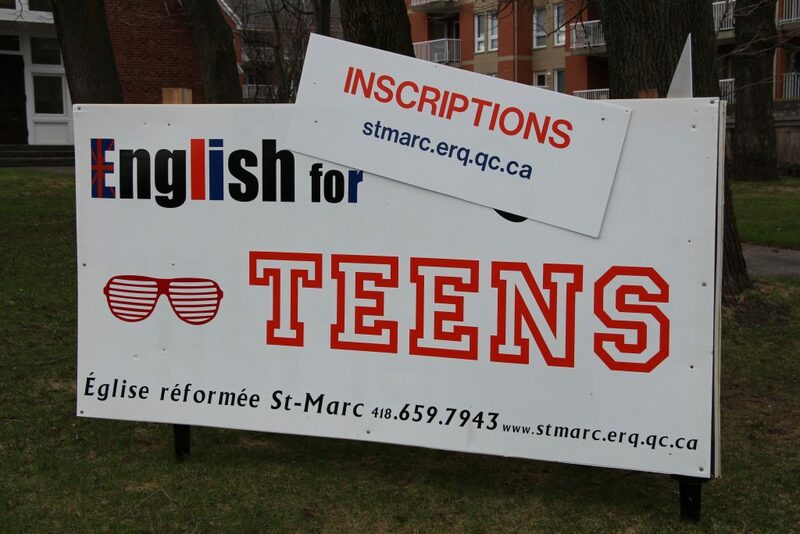 As kids graduated from the church's "English for Kids" Camps, they continued to want to learn English, so "English for Teens" was created in 2013. 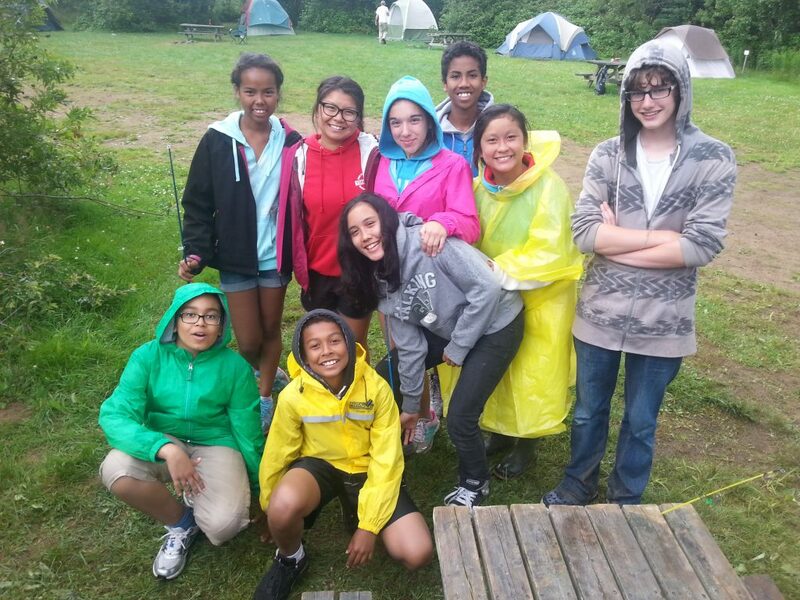 For a week, teens are immersed in English in a campground environment. This allows them to learn camp vocabulary and enjoy God's creation. But, of particular importance is communicating the Gospel truth in word and action. As one who has been on several mission trips both domestically and abroad, it is interesting how much things stay the same, regardless of where you are. Spiritual starvation. While the culture and language may be different, the reality of sin doesn't disappear. While adults may try to hide it, kids and teens have not necessarily perfected that skill. Working with teens from broken families reminds one that sin is everywhere. No one is perfectly good and they know it first hand. They want a solution. Working with a limited vocabulary to explain Christ and the life of gratitude that follows can be difficult, yet eternally worthwhile. While this trip was definitely a seed-planting endeavor, it is exciting to see the promise and produce of St. Marc's camp programs. "It is all too easy for me to think of the church as the building I go to on Sundays. Entering another church building in another country with another language, and finding there many brothers and sisters gathered in God's presence, I was struck by how our God is not like the other gods. He is not limited to the land of the Philistines (like the Philistine gods were said to be), nor to Portland (where I come from). He is building His church throughout the world. We had the opportunity, not only to experience the unity of the universal church in worship and fellowship, but also to be part of His church-building. "Looking back on this experience, I am compelled to look again to God's greatness and grace. I can think of many things which I wish I had done differently. I wish I had been able to give better answers to some thoughtful questions, such as, "Why didn't God make us stay perfect?" and "How can God forgive us?" I wish I had been more patient; I wish I had been more ready to give a defense of my hope; I wish I could have seen the fruition of the seeds that were planted. Ultimately, I need to lay aside these weights and trust Him who began the work to bring it to completion. I need to believe in His Word, as I told our camp participants to believe in His Word: I will build My church, and the gates of Hades shall not prevail against it. (Matthew 16:19, NKJV). This is as true in Quebec as it is in Portland, and it is true wherever you are, too." It can be tempting to feel discouraged when God calls other men and women to a foreign field while the rest of us stay at home. While one could spend a couple hundred dollars to visit an exotic place and be in an "evangelistic" frame of mind, we are all called to serve as witnesses of Christ right where we happen to be in life. Quebec is as hard ground and uninviting as your secular workplace and school. Just as we fervently pray and share when the opportunity arises, those who go out start with prayer and go when the opportunity arises. If an opportunity arises domestically or abroad, take it. When he saw the crowds, he had compassion on them, because they were harassed and helpless, like sheep without a shepherd. Then he said to his disciples, 'The harvest is plentiful but the workers are few. Ask the Lord of the harvest, therefore, to send out workers into his harvest field.' (Matthew 9:36-38, NIV). Click here for a Photo Gallery from "English for Teens 2014."